Women’s Studio Workshop was founded in 1974 by Ann Kalmbach, Tatana Kellner, Anita Wetzel, and Barbara Leoff Burge. Their goals were to develop a studio workspace for artists to create new work and collaborate. Programs were centered on the artistic process. They envisioned a society where women’s art was integral to the cultural mainstream and permanently recorded in history. The first studios were in a two-story single-family home. Etching was in the living room, papermaking was in the attic, and screen printing was in the basement. In the years since then, WSW has grown to become a full-fledged professional studio facility. 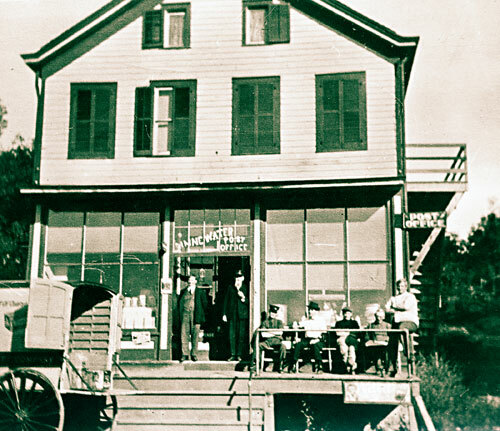 The studios at the corner of James and John Streets were the site of small community-based printmaking and photography classes. The confines of the space encouraged the founders to develop a series of off-site public programming that featured the work of women artists. Women’s Work in Film and Video, a long-standing series of topical films made by women filmmakers, and Outskirts, a series of off site art exhibits, were initiated in 1976. These seasonal series were housed alternately at bars, dance studios, or libraries—any place where they could access a new audience. Flying Objects, RoadWorks, Art Off Track were all public sculpture installations designed to engage the public in non-traditional sites. Read more about our history of public arts projects here. The Binnewater Arts Center after its first renovation. 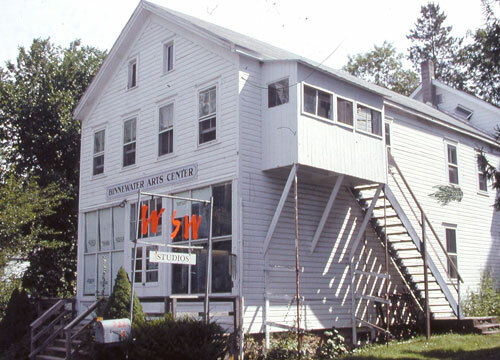 In 1983, WSW moved into a larger facility in Binnewater, a mile outside the village of Rosendale, making it possible to bring all programming under one roof. 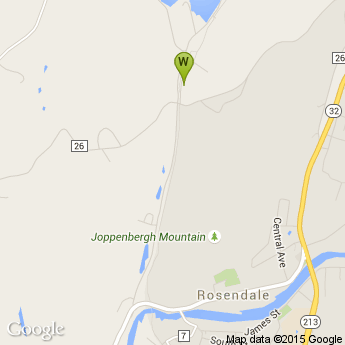 It’s home is an historic building that was once the Rosendale Cement Company Store and Post Office. In the 18th and early 19th century, the community consisted of miners who dug limestone from area mines and transported it to nearby kilns where the rock was heated, then ground into Binnewater Cement. The new facility also made it possible to offer extended artists residency grants, offer intensive workshops Summer Art Institute, and create internships opportunities for young women artists. Initially residencies were for producing artists’ books. WSW has become the largest publisher in North America. Over time new sources of funding helped expand the residency opportunities for artists working across all of our media. Today WSW offers the only visual arts residency focused on women artists, substantially supporting the careers of more than 650 artists from 45 states and 24 countries. As the studio programming grew, the facilities expanded first adding letterpress, then ceramics. Complimentary woodworking and welding equipment were added to support artists’ projects and augment the education programs. WSW was an early proponent of hand papermaking. The program began in the late 1970’s with a production mill that produced stationeries, diaries, sketchbooks and ephemera. In 1996 WSW closed the production mill in order to focus on experimenting with nontraditional fibers for hand papermaking and developed ArtFarm. Over 100 different plant fibers have been grown, gleaned, and tested for their use in creative papermaking. The ArtFarm program is central to all of WSW’s arts education programs. 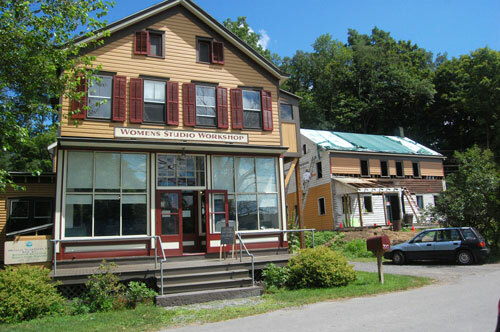 Women’s Studio Workshop Today, with our newest building under renovation to the right. Our internship program began as a way to support the Summer Art Institute instructors, but quickly these talented young artists became integral to the daily operations of the studios. In 1999 a neighboring derelict house was purchased and renovated as permanent housing for interns and additional visiting artists. WSW’s internship program is more competitive than most graduate schools. More than 150 recent art school graduates have received housing and a stipend for periods of six months and longer, working alongside the staff and visiting artists while maintaining a studio practice of their own. In 1985, WSW developed an arts education program that has become a model of studio-based learning. Hands-on Art invites students from fourth grade through high school to come and work as artists with artists in a series of day-long sessions in each of our studios. Through Hands-on Art, over 6,000 public school students have come to work in the studios. Today, each of the four founding women artists remain involved in the life of the studios. Together with a vibrant new generation of staff, WSW continues to refine its programs and studios in order to provide the finest opportunities for artists from across the country and, increasingly, around the world.